Whether you realize it or not, the concrete block you are using is stronger than it was a few years ago! The National Concrete Masonry Association (NCMA) conducted an extensive test program of modern concrete block assemblies, and determined that the unit compressive strength properties that have been in the Code for decades were based on more variable test methods from the 1950’s through the 1980’s that led to very conservative strength values used by design engineers. The NCMA study findings were published in a report dated July 2, 2012 entitled “Recalibration of the Unit Strength Method for Verifying Compliance with the Specified Compressive Strength of Concrete Masonry” (MR37). Figure 1. 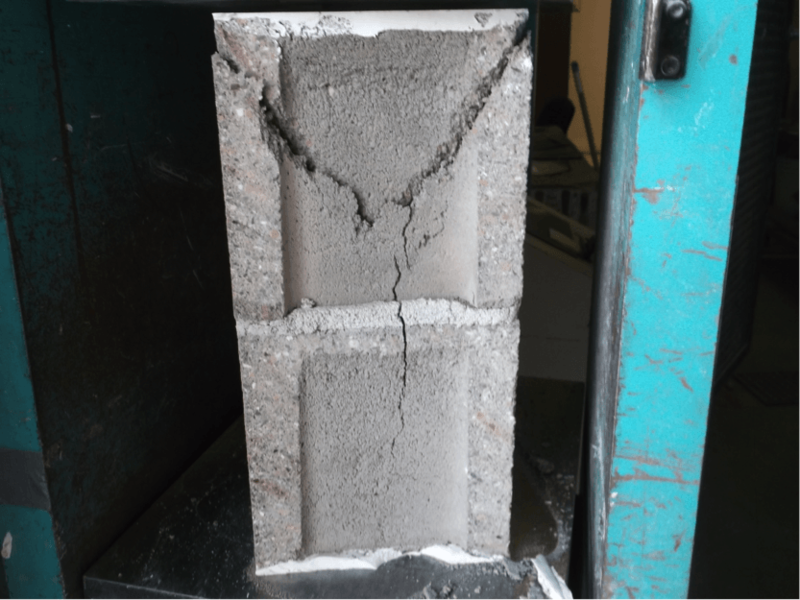 Close-up view of a concrete masonry prism test after ASTM C1314 compression testing. The end result of this study is a new unit strength table that is already in the masonry Code and Specifications (the 2013 TMS 602-13 a.k.a. the MSJC Code). This new table generally provides higher assembly compressive strengths (fʹm) for a given combination of block strength and mortar type. The old table is shown in Table 1 and the new table is shown in Table 2. Table 1. Unit compressive strength table for masonry assemblies from 2011 and previous versions of the Code (TMS 602/MSJC). Table 2. Unit compressive strength table for masonry assemblies from 2013 version of the Code (TMS 602/MSJC). These tables can be confusing (even to the designers using them), so an example can give some idea of the effects of the change. With a Type N mortar in the old (2011 and previous) Code, in order to provide an assembly compressive strength (fʹm) of 2,000 psi, the concrete block strength needed to be 3,050 psi. Now, a 2,000 psi fʹm only requires the block to be 2,650 psi. The NCMA research also recommended a new minimum concrete block compressive strength of 2000 psi. This change has already been made to the ASTM Standard (C90) in 2014. So what does this mean for masonry contractors? Masonry designs will use the masonry strength more effectively and this will help make masonry a bit more competitive. Maybe more importantly, you may be able to solve a “low break” problem with a concrete block prism simply by pointing to a newer version of the Code. Since most designers use the Unit Strength tables to determine fʹm, lower compression test results on block units could still provide adequate fʹm values using the 2013 Code, even if they were too low using the 2011 Code. So the next time an engineer wants you to tear down your CMU wall, the solution might be as simple as showing him a new edition of the Code!